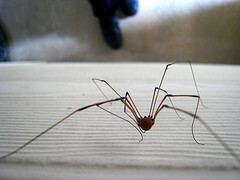 Home > Moods > Where you goin Daddy longlegs? Can someone please tell these ubiquitous Daddy-longlegs to leave me alone? Sorry, I could use the name Crane flies but ever since my flatmate told me what they’re called I’ve become amused by the name. Anyway, back to the point, I wish they would be gone already. They really creep me out. They’re always lolloping around aimlessly wherever I am. Recently, after a long night of making rotis my friend Neidi and I retired for the night only to fly off the bed screaming and running round the room like frantic maniacs, simultaneous trying to avoid and kill a Daddy-longleg, which refused to die. Apparently they’re there’s so many of them because the weather has been mild and they’re an important food source for creatures that eat insects. Maybe that’s why the spiders in the UK have been bigger too this summer? Sighs…. Just some facts I came across while trying to find out the point of this frightening, anxiety triggering insect. I thought perhaps if they had some incredible purpose I could become a little more accepting. Somebody just take them away from me, pleasssseeeee? N.B. No Daddy longlegs have been harmed in the production of this blog, but they will be if they get anywhere close to me! I looove daddy longlegs! I think they’re cute (I’m probably few and far between, though.) The good thing about them is that they can’t pierce the skin of a human to bite them. The great thing is that I’ve never personally seen them TRY to bite me. I think they are the praying mantis’ of the spider kingdom.